How can I make an ultra-feminine room more masculine? It would not be expensive to recover the chair in a non floral fabric. If you use the existing fabric as a pattern, you could even try it yourself. Look up Google for videos. Paint the frame of the bed, bedside tables, chair frame, in the colour of the pendant lampshade. It's a sophisticated colour. 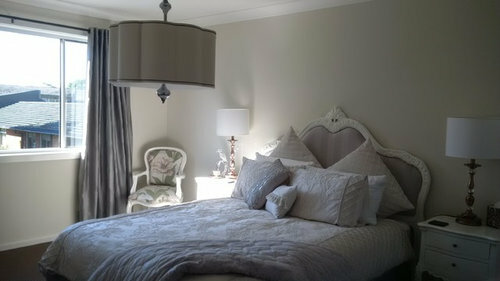 Change the bedside lampshades for the same, or the new fabric colour from the chair. remove the small accent cushions. Blokes hate those. what have you got on the other walls? Can you post photos? The chair is the most feminine thing. If you don't want it masculine, try putting it elsewhere in the house. You also need to move the mirror out, or paint it a masculine colour, or silver. Replacing it with a plain silver one would be way more masculine. paint the table the same colour as the pendant light too. Move the three floral decor items off the table and out of the room. is this staying as a guest room? The room looks lovely as it is - yes, very feminine. It's also quite 'busy' looking in terms of patterns and textures. All elements, including the furniture style featuring filigree and other swirled, curvy patterns really are more inherently feminine. 2) replace bedding with something non-floral. 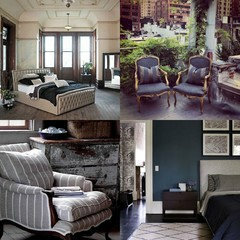 A simple white or even a charcoal grey striped cover would work nicely and tie in with the bed head. 4) remove extra ornaments like the vases and decorative plates on table. Maybe a modern sculpture or some framed pictures in sleek black frames? 5) consider replacing lamp stands as those are also quite feminine looking. 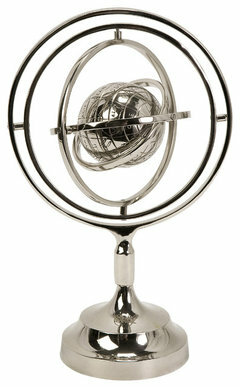 Something more sleek perhaps in brushed chrome? Adding some darker colours in your decor can help ground the colour scheme, too, and keep it from looking so 'light and airy', contributing to a more unisex look and feel. In terms of bedding, streamlining it and making it less 'fussy' looking can help too (less cushions, throws etc.). Note it doesn't need to look plain, but just less texture and busyness can make it feel less girly. I don't really get the feminine/masculine thing. All I see is a beautifully decorated room in a classic style. I think the easiest way is to swap the doona cover to a striped one using the colours already in there. Remove the bird deco thing off the bedside. And minimise the cushions on the bed. Add a darker throw to the end of the bed. If you wish to spend a bit of money switch out the dressing table and mirror for some in a washed wood, similar to the bed frame. Another box, at this price you could get one for safety pins and one for tooth picks. 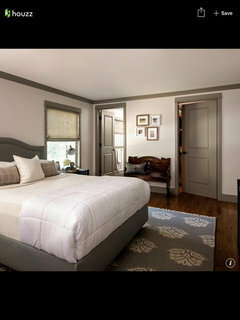 I see you have bedside drawers, a good idea posted on Houzz recently, is to tuck in some paper bags for ladies personal hygiene product disposal. Chair is Beautiful! I don't like all the pillows too fussy (read girley) and get rid of table under mirror and ornaments on top as very girley; maybe half height bookcase instead?? Is there a reason you want it to be more 'masculine'? I think it's lovely and if the rest of the house is more important and you're happy with it then why worry! Do you really want it "more masculine" or just more comfortable for either men or women (or both) to stay in? I'd certainly ditch all the extra pillows and cushions (men aren't the only ones who dislike them!) 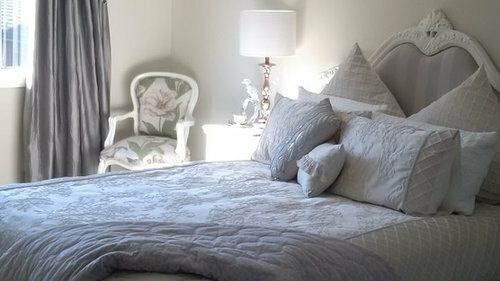 and I'd probably replace the bedding with something in a plain green to pick up the green in the chair. And I'd leave it at that. Just a change of bedding could be enough & even a charcoal/darker grey painted on the wall behind the bed for a bit more drama & contrast. 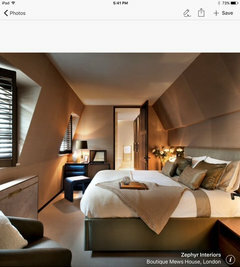 Change the lamp covers & bed throw to match the curtain colour perhaps? 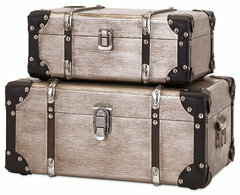 & how about the addition of a couple of masculine decor items? I would remove the trinkets.Change mirror to a plain one and change the doona cover to one with stripes, maybe with a touch of black. Floral and stripes look good together. Then use classic plain pillow cases. However it is a lovely room as it is. A bold feature wall could give some mood to the room again in the above colours. I need assistance to complete this room pls!